Powerful, unbiased search taken to the next level. 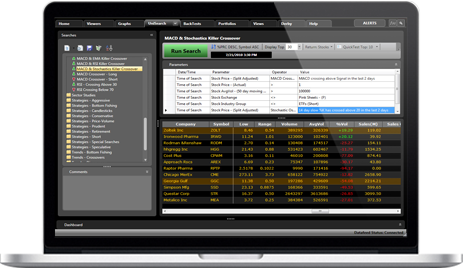 Never before has the retail investor had so much power available in such an easy-to-use, intuitive search engine. It runs over 28 built-in technical searches (easily customizable), or point-and-click to create your own. If you’re tired of searching through endless charts for that golden opportunity, ProTrader 7 Searches is the tool for you. Imagine searching for your favorite technical breakouts with a single mouse click, then looking through resulting charts ranked exactly the way you want to see them. No more scrolling through hundreds of charts until your eyes gloss over. Simply point, click and profit! Finally, a technical trading tool literally anyone can use. You don’t need programming skills or advanced computer knowledge. If you can click a mouse, you’ll be up and running in minutes. Now, with some practice reading charts, even novices can become technical traders. Let ProTrader 7 Do the Work for You! With 28 built in searches (18 long/10 short), you’ll have no problem finding a search to fit your technical trading style. Combine your favorite fundamental screens with your favorite technical, and you’ll have search power at your fingertips as never before. Just think of the combinations! And you can try it for FREE.